Chest (1) - Take the measurement over the fullest part of your chest. Waist (2) - Measure around the narrowest part of your waistline. Hips (3) - Measure around the fullest part of your hips. 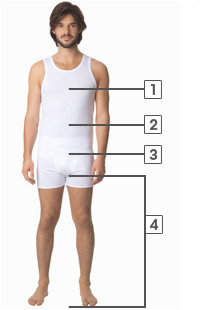 Outer Leg (4) - This is the measurement you’ll need to determine which trouser leg length you need. With your leg stretched out, measure from the hip to the sole of your foot. Inner Leg (4) - This is the other measurement you’ll need to determine which trouser leg length you need. With your leg stretched out, measure the inside of your leg from the crotch to the ankle bone.